Firstly, all cadres and employees of New Pacific Hotel respectfully wish Guests the good health, peace and prosperity. 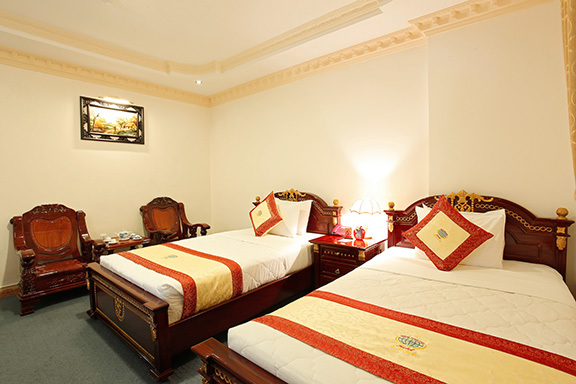 New Pacific Hotel has 120 modern and luxurious room with all conveniences. Besides, it also has services such as Bar-Coffee, Massage, Gym, Karaoke and swimming pool, …Especialy, Buffet breakfast, lunch, dinner is held in the top floor, Guest can both sight the city and enjoy delicious dishes as well as change taste. Luxurious Lucky Restaurant can serve 450 guest and have many small VIP rooms. It can serve European, Asian dishes appropriate to hold wedding, company party, get- together, family party, birthday party. There are 3 rooms with seating capcity from 25 to 200 guests, luxurious seats. With guideline: Guest first, Hotel always meet Guest’s need. Rates include breakfast , 5% service charge and 10% government tax (only 01 extra bed per room is permitted). Extra bed is at US$ 30 Net per bed/room/ night (without Deluxe); including breakfast.